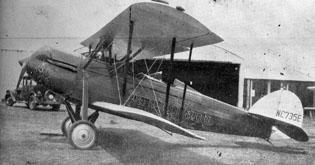 The Bloomington Pantagraph’s first “Scoop,” a Waco “90” biplane, pictured in 1929. Reprinted with permission of The Pantagraph, Bloomington, Ill. In the way that one idea leads to another which leads to another, this post is a flight of fancy. We start with an old family story about the ride my Uncle Pleas took 85 years ago on a plane called Scoop, then to some other stories I found from a bygone era when newspapers could afford their own pilots and planes, then to some flying stories from my career. My mother, Harriet Buttry, was a tireless archivist of family writings before Alzheimer’s took over her mind. A shelf in her home displayed books by authors in the family, and notebooks collected magazine articles and other writings, including too many of my newspaper stories, columns and blog posts.